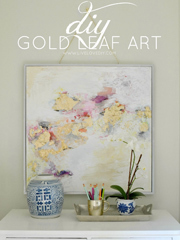 LiveLoveDIY: The Wednesday Six: a new series featuring inspiring DIY & craft ideas! The Wednesday Six: a new series featuring inspiring DIY & craft ideas! Hey ya'll! Welcome to my new series, The Wednesday Six. Here's the deal. I spend a lot of time on Pinterest. I'm kind of obsessed with it. While I'm there, I see so many great ideas from so many talented fellow bloggers. 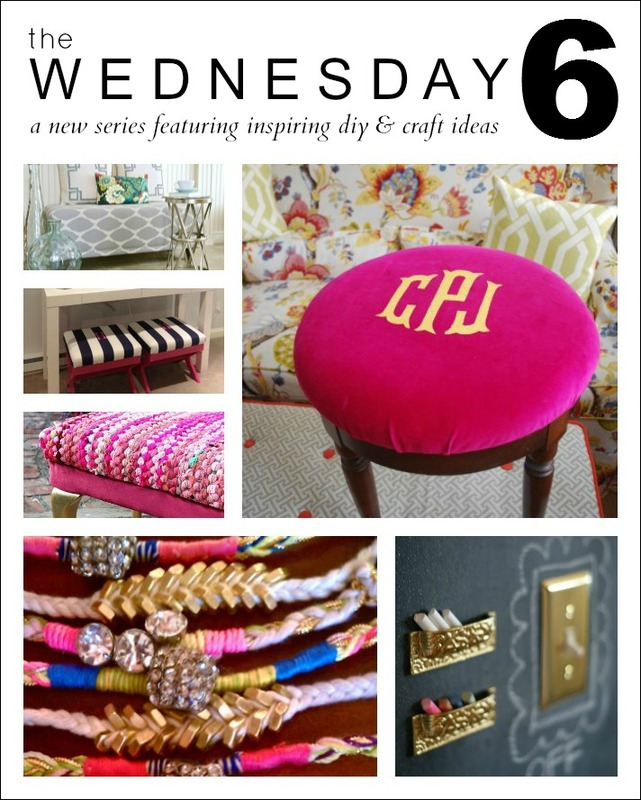 I've decided to feature my favorite six projects every Wednesday here on the blog. Mostly, I'll be featuring DIY and craft projects, but who knows, I might sneak in other random things that inspire me, too! 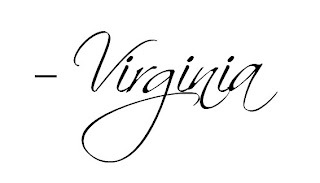 A big thank you to all the lovely ladies who are allowing me to share their work with you today! I'm so honored! Let's get started! As you may know, I have a few things I really love, like repurposing old chairs, using chalkboard paint, and lately...pink. So, this is what caught my eye this week! 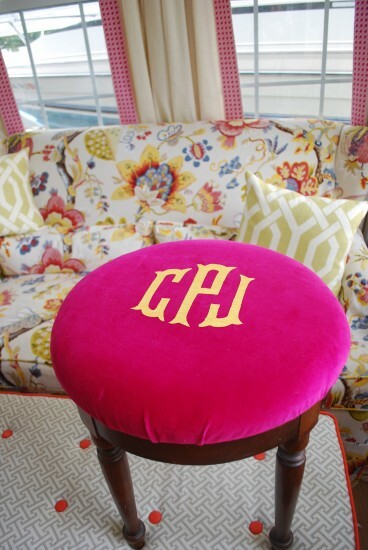 I absolutely adore this DIY pink monogram ottoman from Effortless Style. I'm so inspired to make one of my own. Check out how she made it. It's really cool. I love a good DIY bench, and this one from The Chronicles of Home is amazing. 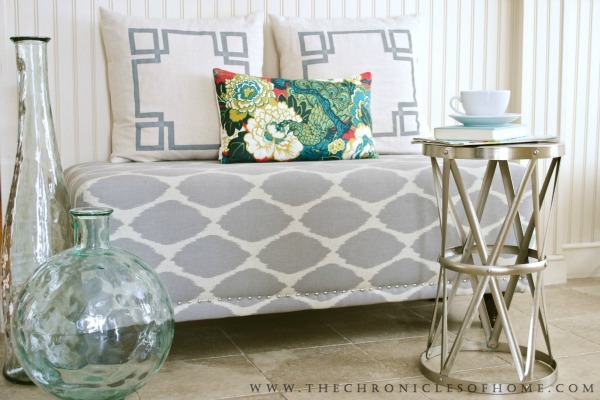 The patterned fabric and nailhead trim is right up my alley. And those pillows! See more here. 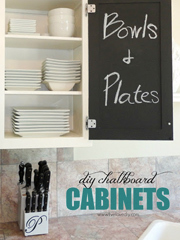 This is such a genius idea from A Little Glass Box. 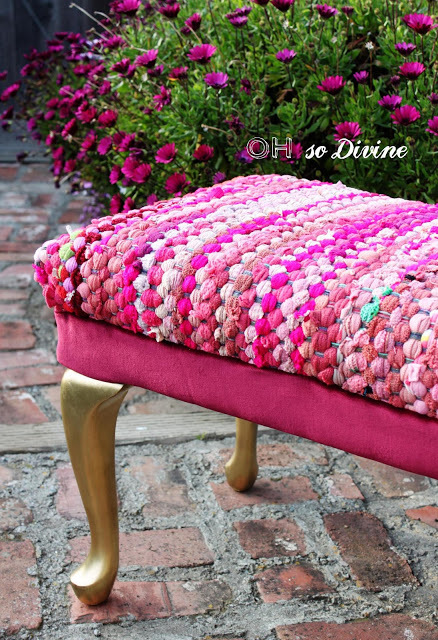 She used a RUG to upholster her little bench. And those gold legs! Check out what this bench looked like before she beautified it here. 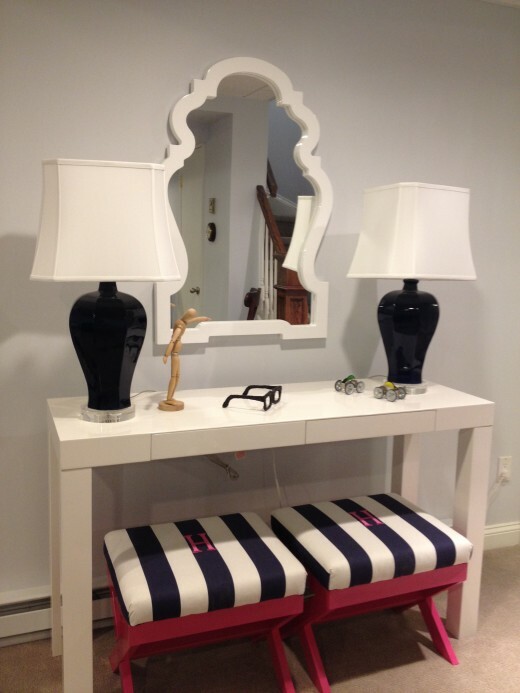 I love the color combo of pink and navy, and Effortless Style totally nailed it on her X bench redo! 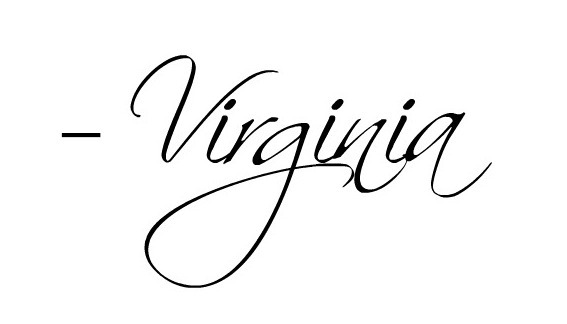 And of course, the monogram is like the cherry on top. See how she upgraded these two benches here. 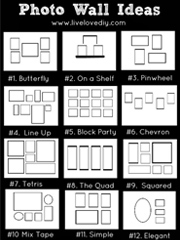 This idea is pure genius from Dimples and Tangles and I can't wait to try it on my own chalk wall. 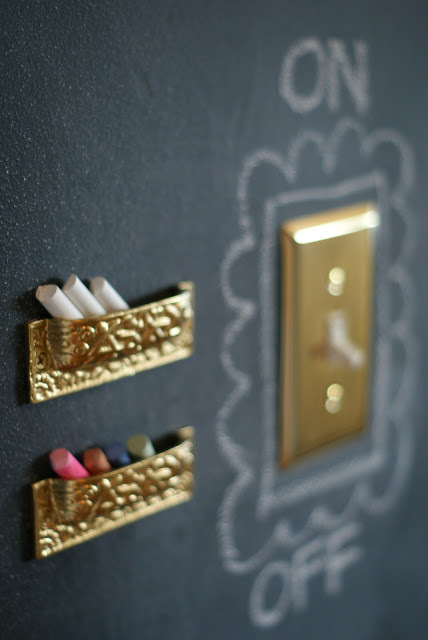 She made little chalk holders out of upside down drawer pulls! Isn't that so smart? See more here. Ya'll probably don't know this about me, but I love fashion. I'm not very good at demonstrating that love, as I'm usually wearing old tshirts and yoga pants, but every once in awhile, I really love to bling it out. When I saw these DIY bracelets from Material Therapy, I stopped cold in my tracks. This is one project I MUST make for summer. See more here. So, that's the Wednesday Six! Thanks so much for stopping by. And thanks to all these lovely ladies for inspiring us today! Do you have a project you'd like to see on The Wednesday Six? I'd love to feature you! You can send your submissions to livelovediy@gmail.com. Thank you so much! Ooh I'm going to really love this series. Everything you featured was AMAZING. Great idea! Great picks! I'm a Pinterest addict as well. 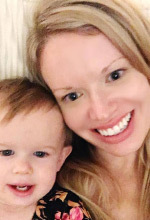 Thanks for sharing your finds! Great idea for a series...didn't you do this a last year but on Fridays? Feature Friday? No, that was with bloggers. I can't keep things straight. I love #2 though...I need to add nailhead trim to something ASAP. I did! Remember that's how we met??!! 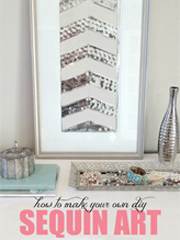 :) And yes, nailhead trim...a MUST. Great new series! Love them all! This is exciting! I may have a bit of a pinterest problem myself! 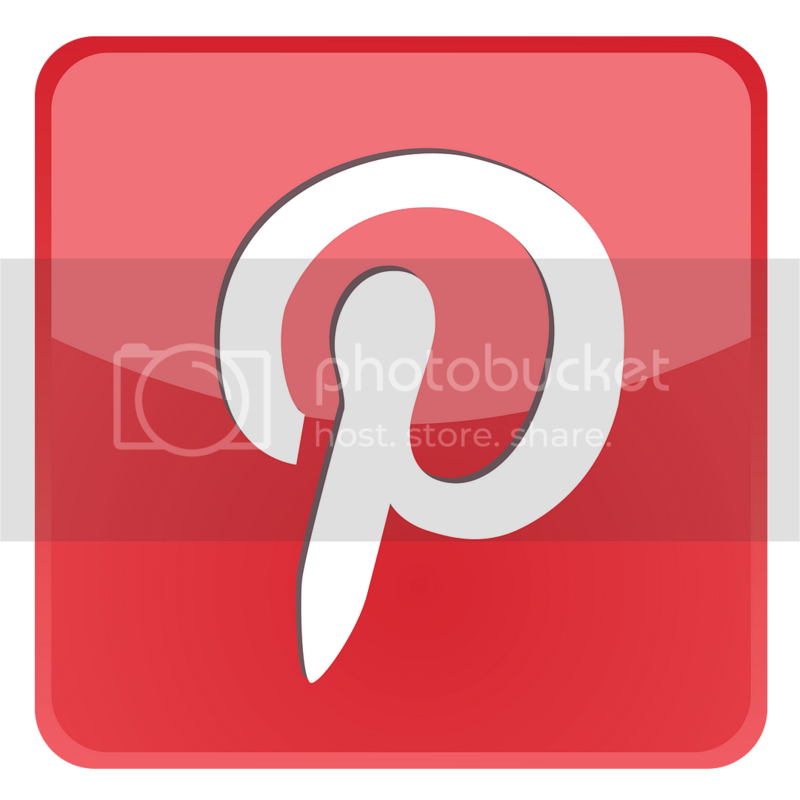 I am also ridiculously addicted to Pinterest--in fact, that's how I was blessed with finding your blog!! Once I was having a hard time falling asleep and I started browsing through Pinterest and then...I NEVER went to bed! I love the bracelets so much. 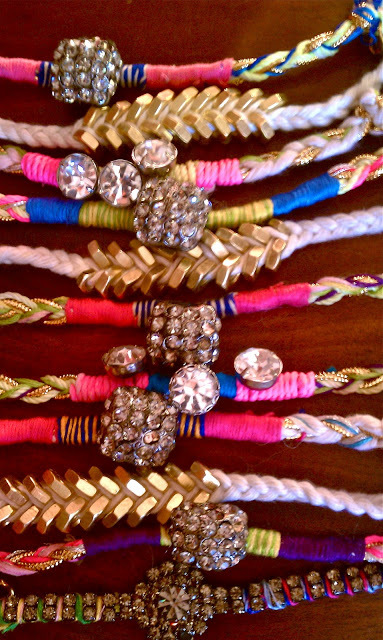 Can you imagine the adorable ankle bracelets you could make, too? Seriously stupidly cute. I also am totally romancing the stripes right now. Love. 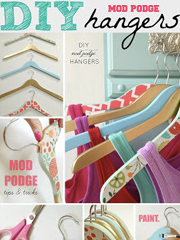 What a great segment idea and props to all our fellow peeps of crafty goodness! !